Progress is moving right along at Islands of Adventure between Toon Lagoon and Jurassic Park as the lot continues to grow and they prepare to lay down foundation. Today they were expanding the footprint all the way to the border of Toon Lagoon. Bamboo has been added along the construction walls to help keep the big hole in the ground from being too easily visible to guests. 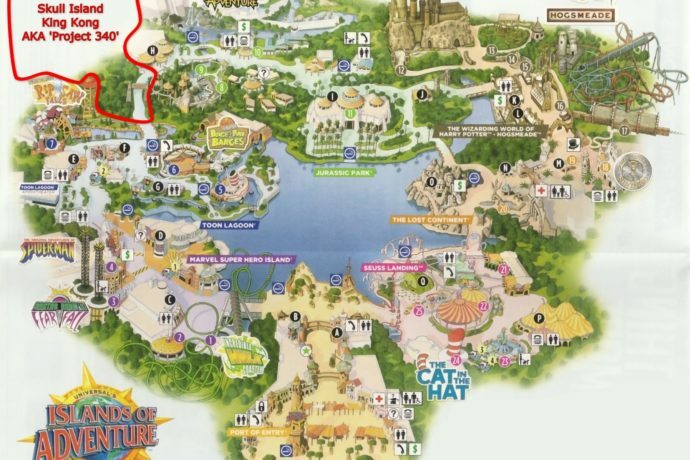 The pathway doesn’t look so bad anymore as concrete where the Jurassic Park arch has been filled in as well. The intrepid folks over at Parkscope uncovered official plans for drainage and construction permits for the area. Dubbed ‘Project 340’, the area is going to cover about 4.5 acres. There has not been an official announcement yet, but word on the street is that it’s definitely going to be Skull Island. Only time will tell. Click on an image below to see a larger version. Bamboo has been added to the outside of the construction walls. Looks nice, but makes it hard to see in. Concrete has been filled in where the Jurassic Park arch was, so no more potted plants. That’s all for now. Check out the previous update. See all the updates here and subscribe to the feed for more updates coming soon!